Kay Sullivan, ACS : Life Brokerage, Inc.
Kay Sullivan joined Life Brokerage, Inc. in July, 1996 and has worked every aspect within the agency. She specializes in the Life and Annuity administration department helping our agents through contracting, new business, customer service and claims. She started in the insurance industry helping employees with medical health claims with Browning-Ferris Industries in Charleston, WV. 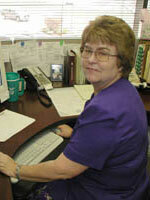 She then took over as the office manager for John E. Pauley & Associates in Charleston. When her husband transferred to Cincinnati, she joined American Druggists Insurance Company working as an Administrative Assistant to the underwriting department for commercial trucking. She has almost 20 years experience in the insurance business. Kay Sullivan is not affiliated with SagePoint Financial, Inc.